Euripides competed with two other playwrights for the Athenians’ first prize for a set of three tragic plays and a comic (possibly obscene) satyr play. We have none of his complete tetralogies, but the seminar mimics that Athenian competition by discussing each of a tragic trilogy—The Bacchae, Hippolytus, and Medea—ending with Alcestis, which Euripides presented instead of a satyr play. 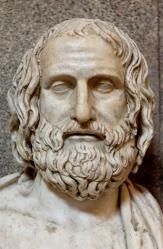 From his lifetime until ours, Euripides caused controversy. In his Poetics, Aristotle judged him the most tragic of playwrights, but in The Frogs Aristophanes had Aeschylus attack him as degenerate. He does not give his audience, then or ever, the expected, and the result can shock. all at 11:30 AM in the Whitridge Room.